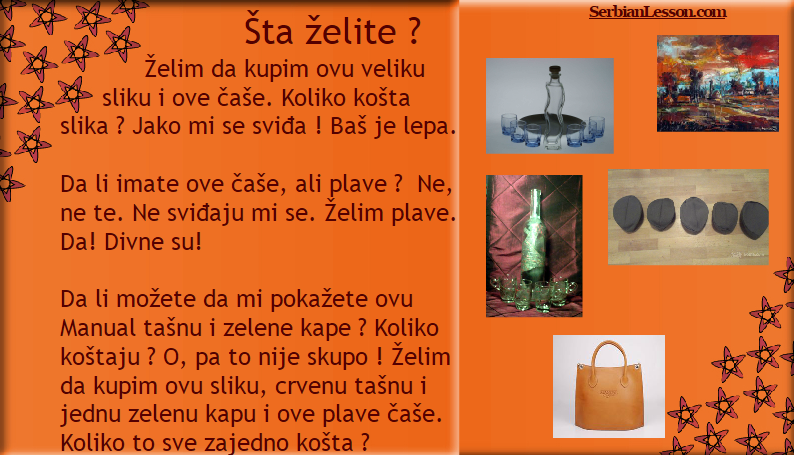 If you are familiar with the personal pronouns in Serbian in the Nominative case, it's time for you to their different forms through various cases. Želim da kupim njih. = Želim da ih kupim. Da li imate njih, ali u plavoj boji? = Da li ih imate, ali plave? Da li možete da mi pokažete nju i njih = Da li možete da mi je pokažete i da mi ih pokažete? Želim da kupim nju, nju i nju i njih. = Želim da je kupim i želim da ih kupim. What does each pronoun in bold refer to? What changes does the word order cause? Personal pronouns in the Dative with "Kafu mi draga ispeci"
Personal pronoun "we" in different forms with "Moja draga"
Personal pronouns in the Accusative and possessive adjectives with "Dudo"
Mixed personal pronouns with "Tako mi svega"
and we will practice them together in the next post!